1. Melt the butter in a heavy-bottomed frying pan set over a low heat. Add the shallot, salad onion, garlic and a pinch of salt and gently fry until soft but uncoloured – about 8 minutes. Add the wine and 250g peas; braise over a low heat for a further 10 minutes. 2. Defrost the remaining 150g peas in warm water, then drain and whizz them with the parsley and about 2 tbsp water to loosen. Season and set aside. 3. Add the oats and 200ml water to the pan and stir continuously for 10 minutes, until the mixture has come together and is cooked through. It should look like a stiff breakfast porridge, so add a splash more water if you prefer a looser consistency. Stir in 30g grated manchego, season and take off the heat. Stir in the pea and parsley purée. 4. Put a splash of oil in a frying pan set over a high heat. When it’s almost smoking, add the asparagus, season and fry for about 2-3 minutes on each side, until coloured and tender; set aside. Add a splash more oil and fry the eggs. Divide the porridge between plates or shallow bowls. 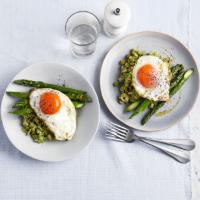 Top each with the asparagus, a sprinkle more cheese, a fried egg and a grinding of pepper.